Best Tea Party Etiquette Tips! Tea parties are usually a very formal affair. In fact, the whole concept of the tea party is all about etiquette, poise, and grace. If you have never been to one before, you might want to read the tips on this page and then practice with children. You would be surprised how much enjoyment a bunch of young girls would get out of learning how to act during a tea party. When it comes to the tea itself, the basic tea party etiquette rule is to drink slowly and silently. No one should be able to hear you slurp or sip the tea. If you are wearing gloves to the tea party, proper tea party manners state that you should remove the gloves before doing anything with the food or drink. Upon arriving and being seated, the very first thing you should do is to place the napkin on your lap. If your tea is not poured for you, then you will need to do it. Right after pouring, this is when you would add any lemon, milk, or sugar to the tea. Regardless of how small the muffins or deserts are, you should never put the whole thing in your mouth in one bite. This is considered impolite and not proper tea etiquette. Always follow the lead of the host. They will either serve everyone at the party, or they will indicate for everyone to serve themselves. As you are stirring your tea, you do not want to clink the spoon against the side of the cup. It could chip the china and that is not the impression you want to make. Just set the spoon down on the saucer. Depending on the number of courses that are being served, the silverware on the table will vary. If you are not familiar with proper table setting etiquette, then start with the outermost silverware and work towards the inside as the courses progress. 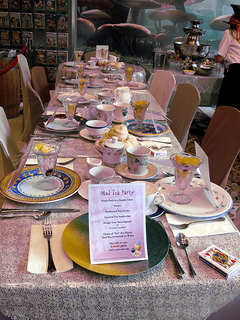 These tips should have you drinking tea in style at the next tea party you are invited to. Enjoy!